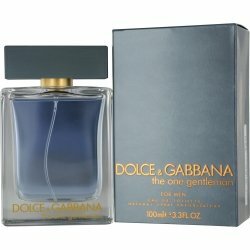 Dolce & Gabbana The One Gentleman by Dolce & Gabbana for Men Eau De Toilette Spray / 100 Ml. What is a gentleman? The meaning has changed over the years, but the essence remains the same; he is a man who is multi faceted and knows how to treat a lady. This is a sophisticated and modern scent for men. Notes include pepper, fennel, lavender and cardamom, while a base is composed of vanilla and patchouli. the fragrance was created to celebrate the 20th year of Dolce and Gabbana’s fashion and designs.